The Band would like to thank the townsfolk of Abergavenny for their tremendous support over the Christmas period. A very successful Christmas concert was reinforced by the generosity of peoples donations to the band when we played carols in the town centre and at Waitrose Supermarket. Overall, 2015 has been a year of change for the band and we are now set up ready for the year ahead which promises to be very busy and exciting. We all look forward to the new challenges the band faces with renewed dedication. Our new Musical Director, Alun F Williams, and Youth Band MD, lana Tingay, have both worked hard to prepare the band for the future and there is still much to be achieved. As we hang up the Christmas hats until next years concert, the Band wishes all its supporters and friends a very happy new year. Strolling around the food festival on Sunday 13th December was torture. Everywhere we went there were tantalising aromas of freshly cooked treats, breads, pies and more. It was enough to put you off your carols. Nevertheless we got through it, stoically delivering carol after carol midst the heavy scent of mince pies, rum and cinnamon. What a brave bunch of players we are? The crowds enjoyed the carols as we played in the Market Hall, Brewery Yard and Priory Square led by the Food Festivals own “Speckled Hens”. Yet another Christmas event under our belts and another thank you to everyone who joined in. They say you should never work with Children and animals. I’m sure this refers to the potential for catastrophe but Saturdays annual Christmas concert proved the saying wrong. The senior band shared the stage with our own Youth Band and the school choir and brass project children from Our Lady and St Michaels Church. A sell out audience was treated to a feast of Christmas entertainment from all participants including 12 “dads” from the stalls who were coerced into taking the stage for…you guessed it “The 12 Days of Christmas”. Expertly compered by Youth Band MD, Lana Tingay, band and singers delighted the audience with a wide variety of Christmas music that included traditional carols, movie themes and even a selection of Christmas pieces in the Big Band style of James Last. Musical Director, Akun F Williams thanks everyone connected with the band for an excellent ‘The Glory of Christmas’ Concert, following on from the hard work in preparing for the contest in Merthyr in November. The band continues to work hard on all aspects of sound and musicianship and this was evident again on Saturday. Alun added “I would also like to thank everyone who organised and set up the concert and also to Lana Tingay, who not only played with the senior band, but conducted the wonderful Abergavenny Youth Band, Our Lady of St Michael’s School Brass Project and Choir and compered the whole concert! Also thank you to a super audience who really helped make the evening a very memorable one! We now look forward to a very successful 2016”. Band members braved the elements to entertain shoppers in the town on 5th December. The windy conditions added to the challenges of playing in the open air when our players put on their winter thermals to keep warm during carol playing. Sustained by lots of warm drinks the band was well received by the towns folk who gave generously and even joined in with a few items. This was a valuable fundraiser for the band and we would like to thank the people who donated for their magnificent support. 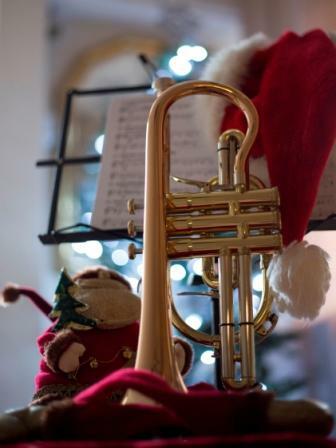 The band is now preparing for the annual Christmas Concert in the Borough Theatre on 12th December which will be followed the next day by more carol playing at the Abergavenny Food Festival. Its time to get in the Christmas mood and how better than to join us for our annual Christmas concert on December 12th at 7:30pm in the Borough Theatre. This year we will be joined on stage by Our Lady & St Michaels School Year 4 brass project and singers. Of course the concert wouldn't be complete without our very own Youth Band and they are hard a work with their MD, Lana Tingay, preparing a great programme for you to join in with....you have been warned!! The Senior Band is also hard at work with MD, Alun Williams, polishing its Christmas repertoire in readiness for the concert. Tickets are £8 (£6 concessions) and can be obtained from the Borough Theatre Box Office (01873 850805) or online at www.borough.ticketsolve.com. It promises to be a fun packed evening and we all look forward to getting you in the festive mood. The guest of honour, Abergavenny Town Mayor councillor Maureen Powell, toasted the Band and said how proud t he people of the community are of the Band. With many successes over the years and its willingness to support the Town and perform at local events and civic occasions, she emphasised how important the band is to the life of the town. The guests were treated to a veritable feast lovingly prepared by our own Master Chef and Band Secretary, Megan Prosser before the evenings formalities got underway. Thousands of "foodies" flocked to Abergavenny to enjoy this year’s Food Festival on Friday Sept 19th to Sunday 22nd and there to entertain them in the warm Saturday sunshine was the sparkling Borough Band. Abergavenny Food Festival is the biggest and best-loved food festival in Wales. Established in 1999, it was set up to celebrate the craft, diversity and culture of food from across the country. he award winning festival now exhibits over 200 of the finest food and drink producers, a variety of expert demonstrations and a line-up of outstanding and well-known chefs, welcoming over 30,000 visitors to the beautiful market town each year. To accompany the excellent cuisine what better than a concert from the towns band. Performing in the castle grounds at lunchtime and later in the day at the Brewery Yard the band enjoyed excellent support from the many thousands of visitors in town for the Festival. The band was led by our Musical Director, Alun F Williams who chose a programme to suit all tastes and even encouraged some revellers to dance along to some of the pieces. The Band was proud to participate and support this magnificent event and looks forward to the Christmas Food Festival. The band are pleased to welcome Nigel Bard who was until recently with Abertillery Band and now joins us on Trombone. Not only can he produce a sweet sound in the band room but the band has already sampled his expertise in the kitchen, he makes a mean cheesecake. It's been all change at Abergavenny recently. Earlier in the year we were lucky enough to secure a new soprano player, Nigel Stallard who hails from over the border. He brought with him added value as we also gained Debbie Stallard, (also a dab hand at baking) back row cornet. The bands numbers have increased further in recent weeks with familiar and fresh faces. Erin Shorey, horn, returns from Pontypool and joins her father, Richard, who has also recently stepped up from helping the youth band. Also from the youth band comes Joy Dando, back row cornet and Jacqui Forest-Jones, percussion to add to the numbers. We see the return of two 'old' player, Janice Cooke, who has been absent for some years taking a rest from banding and Deb Bull our much missed solo horn returns from a very brief 'retirement'. If there is anyone else out there a warm welcome awaits you at Abergavenny. Rehearsals are Tuesdays and Fridays, 7.30 - 9.30 pm at the Band Room, Prospect Road, Abergavenny. On Friday after rehearsal the band repair to their local. the Somerset Arms, to finish off the evening with conviviality. and the odd glass of liquid refreshment. Directions to the band rehearsal room can be found here. An Honour to lead the Eisteddfod Proclamation Ceremony. The people of Caldicot and the rest of Monmouthshire and the surrounding area will have their chance to savour some of the pomp and ceremony of the National Eisteddfod on Saturday 27 June this year as the town’s castle plays host to the welcoming ceremony for the 2016 Eisteddfod, which will be held on the outskirts of Abergavenny from 29 July – 6 August next year. Local performers and schools will perform on two stages on Newport Road in the centre of town during the day with an emphasis on music and dance. Slots for these stages have all been filled and details are included below. Abergavenny Borough Band will lead a procession of local dignitaries and the Gorsedd of the Bards will leave the centre of town shortly after 14.00 for the procession to the castle grounds. The aim of the procession is to show the welcome and the enthusiasm which exists locally for the Eisteddfod and it’s also the chance for the Eisteddfod to look forward to its visit to the area. 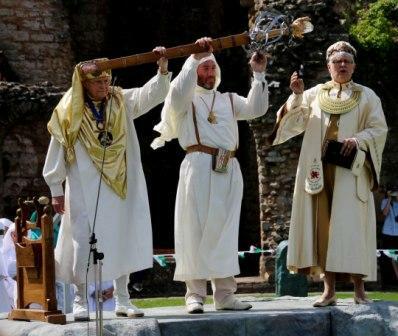 Once in the castle grounds, the Proclamation Ceremony itself will take place, at which the Chair of the local Executive will present the first copy of the List of Competitions to the Archdruid. On the evening of Friday May 29th the band was delighted to welcome the Musikkapelle Thanheim to Abergavenny. The 60 piece wind orchestra is one of the longest established in Germany and will celebrate their 255th anniversary next year. 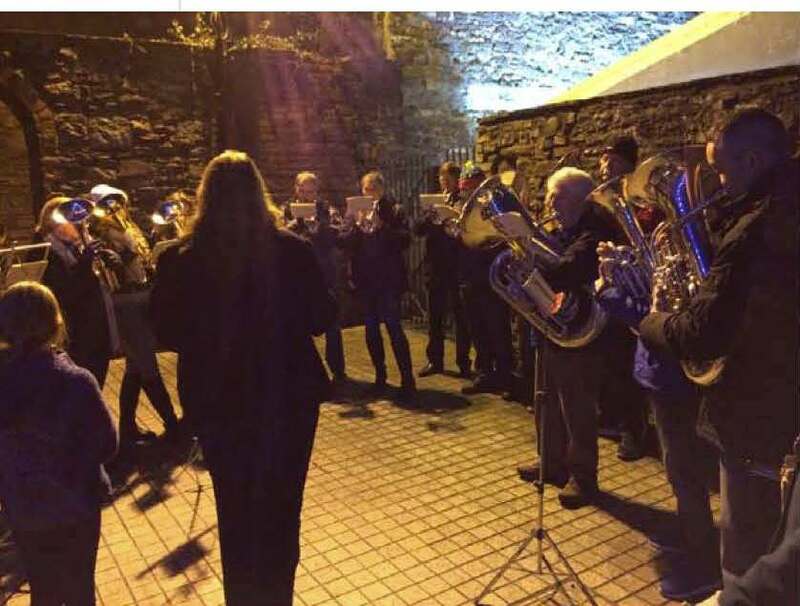 The massed bands of Thanheim and Abergavenny first undertook a joint rehearsal together at the Abergavenny Community Centre, after which they then enjoyed a social evening together at the band's regular haunt, the Somerset Arms. 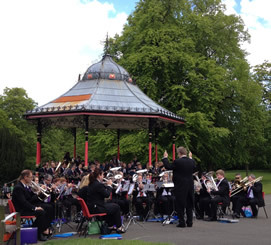 On Sunday May 31st, the two bands then combined in concert at Bedwellty Park, Tredegar, launching the summer season of events at the landmark site with a joint performance featuring all 90 musicians. The two bands each performed a selection of solo items before combining in a set of massed British and German music which included Richard Strauss' "Also Sprach Zarathustra", Major Denis Burton's "On Parade", "Nimrod" from Elgar's Enigma Variations, Beethoven's "Ode to Joy" and John Mackenzie-Rogan's "Bond of Friendship". All at Abergavenny Borough enjoyed a superb weekend in performance this bank holiday at both Llandovery, Carmarthenshire and in Abergavenny itself. On Saturday May 23, Abergavenny appeared as guest artists in the annual concert of Llandovery Male Choir - Cor Meibion Llanymddyfri. Appearing alongside soloists Lowri Pugh Morgan and National Eisteddfod winning bass Kees Huysmans, the band delighted a large audience with a varied selection of works, that included solo features from Ian Howe, trombone, and Zoe Alexander, flugel. On Sunday, the band then once again supported the annual Vintage Steam Rally, performing in the bandstand at Bailey Park, Abergavenny, with the Youth Band also performing on Monday. Abergavenny Borough were delighted to be involved in and support both these events and now look forward to additional performances throughout the summer months. On Saturday May 9, Abergavenny Borough featured in a grand scale concert to commemorate the 70th anniversary of VE Day. The concert took place at St Mary's Church, Abergavenny and also featured Royal British Legion Standard Bearers, a children's chorus from Our Lady & St Michael's R.C. 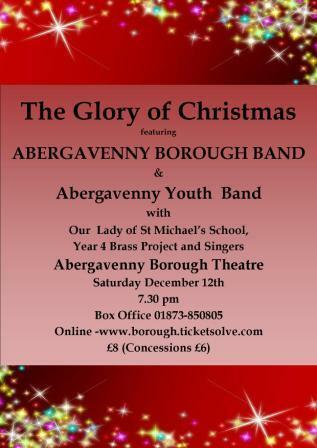 School and Abergavenny Youth Band. Youth and Senior Bands travelled the short distance to Ross-On-Wye today (26th April) to participate in the Gloucester Brass Band Association annual entertainment contest. The Youth Band were up first and played an entertaining programme under the direction of MD Lana Tingay, that included 500 Miles, Everybody Needs Somebody as well as a beautiful quartet rendition of that evocative Welsh folk tune, Suo Gan. Thirty players took to the stage and included some adult learners as well as a few helpers from the senior band. Overall the performance had a few problems for the adjudicator, Bret Baker, but was an enjoyable one for him and he awarded the Yout h Band a Bronze award. The Senior Band enjoyed a hat trick of prizes in the afternoon having presented a "well thought out programme" with style and control. The programme was one that remembered the fallen in the world wars and included Peacemakers, When Thunder Calls, For The Fallen and Big Band Tribute. Our soloist on the day was principal Euphonium player, Peter Jackson, whose rendition of Glorious Ventures received high praise from the adjudicator. The Senior band secured the best first section title, best conductor cup and best band overall. A welcome boost to player morale taking the band into its busy summer diary. Our trip to the Welsh Regional Championships was one we would prefer to forget. However, its always best to learn from such experiences and strive to take the band forward, achieve improvement and build for the future. Coming last but one in a strong line up that saw City of Cardiff (Melingriffith) and Goodwick sounding like potential Championship Section bands in waiting, the band did not deliver its best performance on the stage where it mattered. The adjudicator saw some good in our performance of the test piece, A London Overture, that included excellent comments for the soloists. Sadly, however, this wasn't enough to overcome balance and tuning problems as well as a lack of clarity in the faster sections. 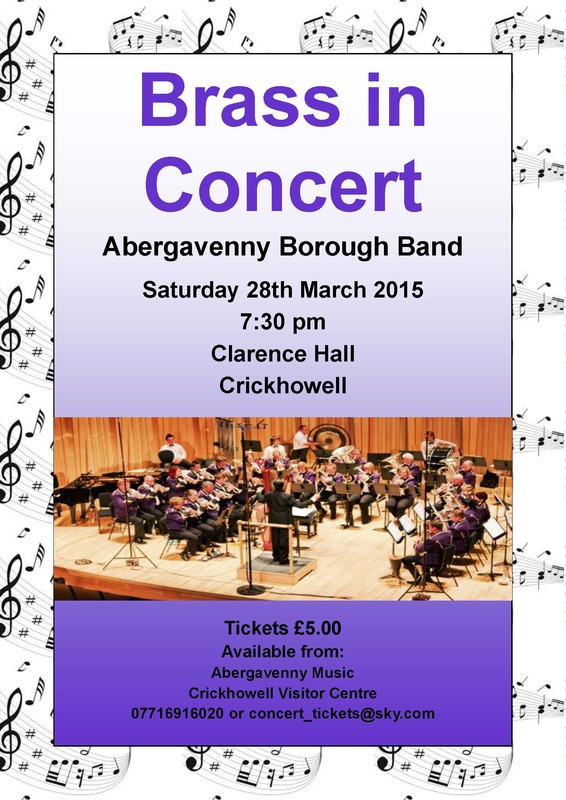 The band will performing its Brass in Concert programme in Crickhowell. This will be only our second concert at the venue in many years and we are all looking forward to renewing our acquaintance with the community. Our new Associate Conductor, Alun F Williams, will be presenting the concert and promises an exciting programme that will appeal to all. The band secured the "best 1st section band" title for the second consecutive year at the Welsh Op en Entertainments Contest in Porthcawl on 21st February. Under the baton of newly appointed associate conductor Alun F Williams, the band played a programme described as "thoughtful and presented with style and commitment" by adjudicator Simone Rebello. The band performed a 20 minute programme which highlighted the talented soloists in the band and also the musicality and sound of the full band. The excellent programme which was constructed by the band's Musical Director, Craig Roberts included pieces from the recent performance by Grimethorpe Colliery Band at the Brass in Concert Contest and had the theme of 'Remembrance' throughout and concluded with a very confident and strong performance of the Peacemakers by Dan Price. 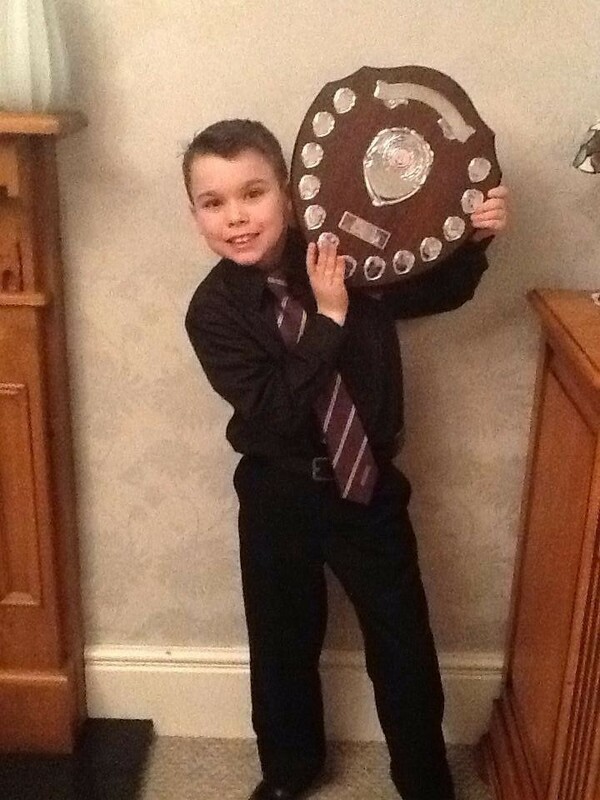 For their very consistent and musical performance, the band were awarded with the best Section 1 Band outside of the main prizes and nine year old percussionist, Zac Roynon-Griffiths was awarded with the youngest player award. Alun commented "I would like to thank Craig, and all the band for their hard work in preparing for this contest and also to wish them all the best for their next contest appearance in Swansea on 21st March. I look forward to conducting the band again at the Clarence Hall, Crickhowell on Saturday 28th March"
Dave and Diane Mogford and Phil Bull attended a ceremony with the Borough Council on Thursday 12th February w here they were presented with the Town Shield Award by the Mayor. This is much deserved and acknowledges the lifetime of commitment and service they have all given to the band. Their combined service totals 136 years with Dave, a mere babe in arms when he joined, topping the bill at 49 years. Diane follows closely behind with 46 and Phil 41 years. They were entertained by the Mayor and Borough Councillors. The band was represented by Terry, Jon, Meg and Jackie. Abergavenny Borough Band is delighted to announce that Alun F Williams has accepted the post of Associate Conductor with the band. 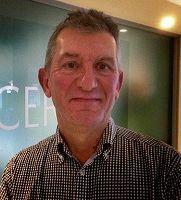 Alun is the former Head of Gwent Music Services and now Chairman of the National Youth Brass Band of Wales. He has worked with Abergavenny on numerous occasions previously, enjoying many contest and concert successes with the band, and brings a wealth of experience and fresh enthusiasm to the organisation. Alun will work in partnership with Musical Director Craig Roberts and Resident Conductor / Youth Band Musical Director, Lana Tingay. Speaking on Alun's appointment, Craig Roberts stated: "It's a great delight to welcome Alun to the team, and with the on-going influx of new players to the band, a fantastic schedule lined up throughout the year ahead and now firm continuity at the helm thoughout, it promises to be an exciting 2015 / 16 for all at Abergavenny Borough". For further information on Alun and the full musical team, visit the Members section of the website here. We are pleased to welcome Nigel and Deb Stallard to the band; Nigel on Soprano Cornet and Deb on 3rd Cornet. 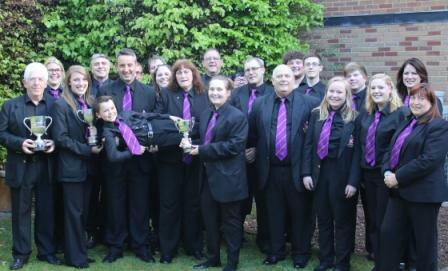 They are relocating to Wales and join us from Stourport Band. Nigel has been playing since he was 6yrs old and has played for the Gloucester Police Band, Malvern Hills, The Malvern Chase Brass band, Highley Colliery Brass Band and more recently with Stourport upon Severn. Deb has played since she was 11yrs old and also played for the Malvern Chase Brass band, Highley Colliery Brass Band and with Stourport upon Severn Band. Band Chairman, Terry Prosser, commented “it’s great to welcome Nigel and Deb to the band and they will bring much needed depth to our cornet section”. The band still has vacancies for 2nd Euphonium, 2nd Trombone, 1st Horn and percussion. Click here to visit our vacancies page. 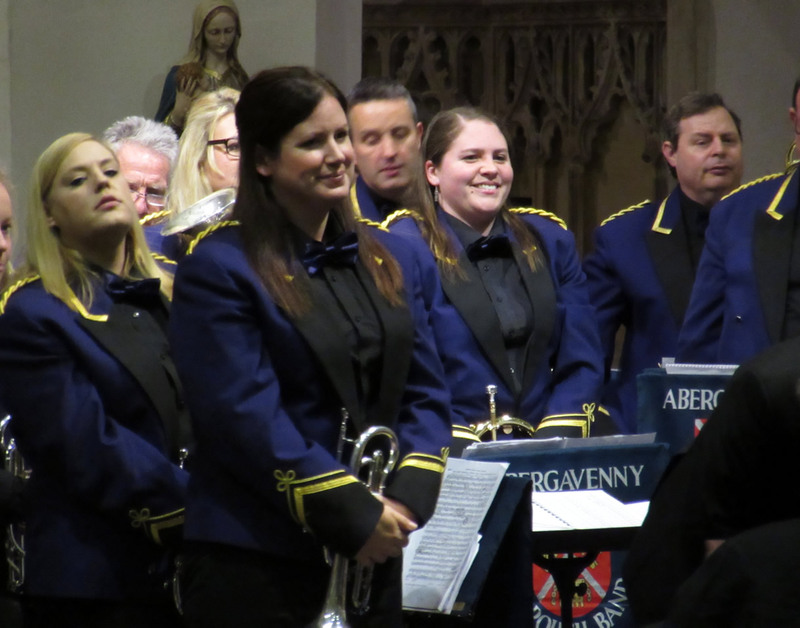 The Abergavenny Borough Band diary for 2015 is now available to view in the events section of this site. The band's calendar for the year ahead includes increased appearances on both the concert and contest fields. Our concert appearances include our Brass & Voices at Easter (Saturday March 28) and VE Day 75 (Saturday May 9) concerts in Abergavenny itself, plus a major event with the world famous Grimethorpe Colliery Band on Saturday May 23. 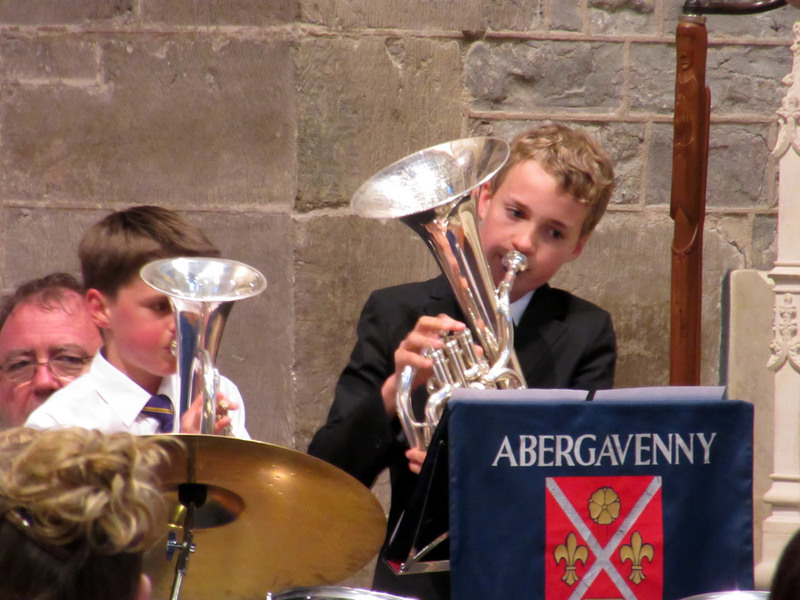 Please visit the events section of the site for full information on all Abergavenny Borough Band and Youth Band events. 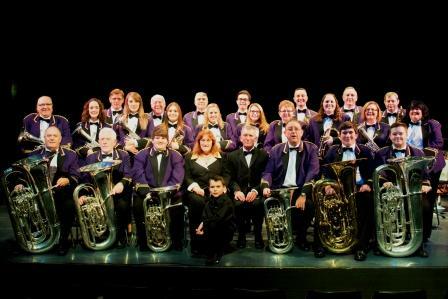 Abergavenny Borough Band is recruiting! Rehearsals are held on Tuesday & Friday evenings from 7:30-9:30pm. Directions to the band rehearsal room can be found here with excellent rail links also available from Cardiff, Newport and Hereford. Please contact the Band Secretary or Chair for an informal discussion, or to arrange to attend a rehearsal. All enquiries will be treated in strictest confidence. In addition to the vacancies outlined above, additional experienced brass / percussion players are always welcome to join our organisation. Please feel free to contact us or visit one of our rehearsal evenings.